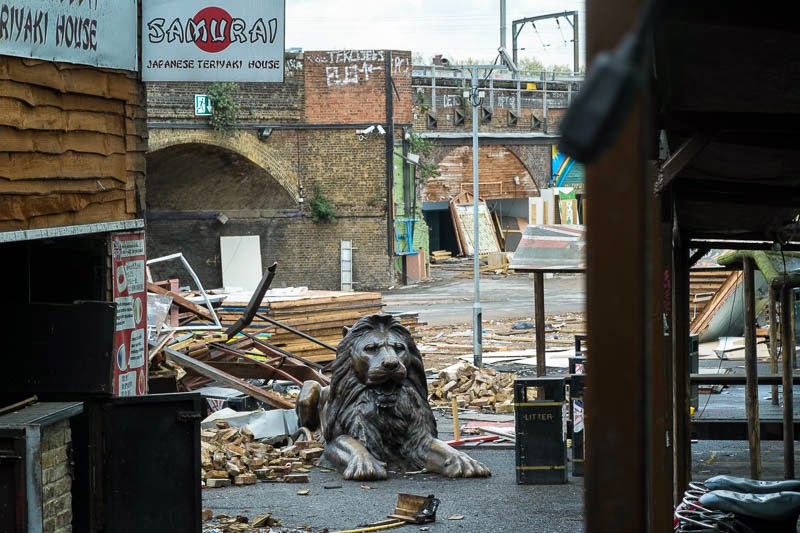 A stone lion sits guarding the remanants of the stalls and food outlets that were part of the Camden Market overlooking the canal. The stalls were demolished to make way for a new infant school and of course for new housing. Progress I believe it is called. The lion sleeps tonight! Hope he stays for the infants to climb all over him. Yup, that's what they call it! The lion seems annoyed by the turn of events. We will have to see what happens to him. That lion has the exact expression of a friend's dog, who is often to be found sitting contentedly among the havoc and destruction he has caused! You're joking! I loved that part of the market! Havent been there for a while. Oh dear. It is at least change. Whether it is also progress will be learned in time. Woe betide the builder who tries to get past him!